I first posted this recipe back in 2013. I’ve been pickling for years, starting off with onions and moving on to gherkins, beetroot and more not long after. 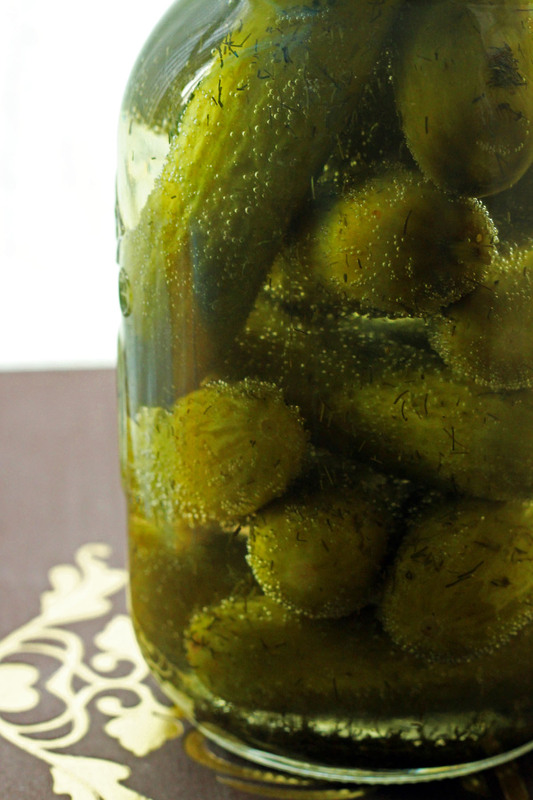 I really struggled with what to call this recipe initially – dill pickles, pickled gherkins and pickled cucumbers are all a variation along the same theme. But what all of these dishes have in common are two key ingredients, baby cucumbers and vinegar. For those who want to go to the extra level of flavour, dill and salt are essential. Pickled gherkins are so incredibly versatile you can eat them with almost anything! If you’re reading this in America you’ll probably be familiar with the dill pickle eaten sliced in a salt beef bagel or alongside other sandwiches at lunch time. Being from England, my first memory of the gherkin was seeing the plump green fruit immersed in a jar of vinegar on the counter of my local fish and chip shop. But for me a gherkin is yet another store cupboard staple that belongs on the buffet table at Christmas. Just like with pickled onions the sharp, sour taste can cut through the rich flavour of any roasted meats and silky cheeses. It’s not just the American’s and British folk who enjoy gherkins though. In France they are called cornichons and are often eaten alongside a charcuterie board or cheese platter – not too different to my Christmas buffet then! Who would have thought there would be so many names for this simple side. Ideally you need to leave these for two weeks. If you crack them open before then though don’t panic they will simply have a more subtle flavour. If you somehow manage to keep them hidden away into the New Year then you are in for a treat! They’ll certainly pack a punch when you bite into their crunchy sweet flesh. 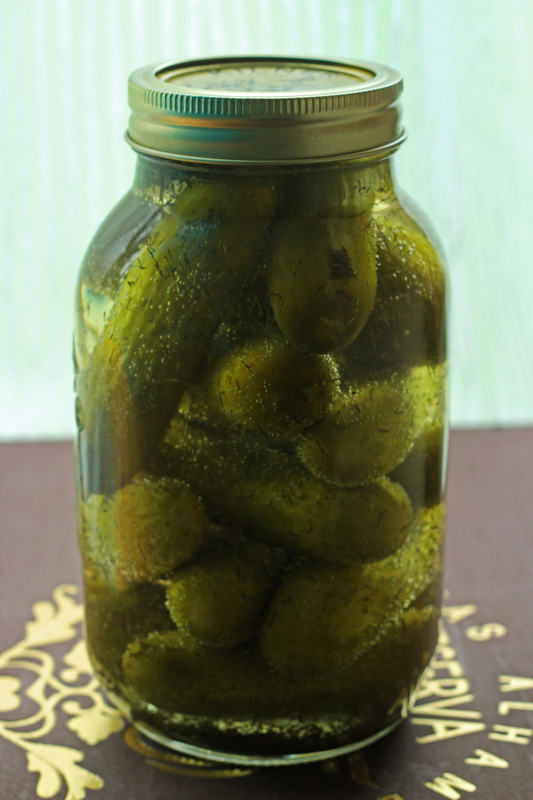 Pickled gherkins are a real store cupboard staple! Heat the vinegar, water, salt and dill in a large pan with the baby cucumbers. Bring to the boil and allow to simmer for ten minutes. In the meantime sterilise a large jar by washing in warm soapy water and placing in a hot oven until completely dry. Once the jar is prepared, carefully transfer the cucumbers to the jar and cover with the vinegar. Immediately seal the jar, turning the lid tight and allow to cool. An air tight seal will have formed when the jar lid is sucked in. Note whilst the total time stated is 24 hours, for optimal results you should let these infuse for at least 48 hours. Because these sweet and sour delights are so incredibly easy to make there is no excuse not to stock your cupboards full of them. Of course you could grab a jar off of the supermarket shelves this festive season, but it’s so much more satisfying to serve a home pickled gherkin alongside your cold cuts then it is to buy an overpriced, branded jar. Are you a fan of gherkins, or do you call them something different back home? What’s your favourite thing to eat them with? I really love gherkins with a buffet and I’ve never made any myself which is weird because I love pickling… Anyway, you mention the many different names given to gherkins and I have one you’ve not mentioned; someone I know calls them Wallies! I have no idea where that comes from, but he’s from London so may be a cockney thing? Anyway, I’m off to google that right now. Happy munching! Wallies!? Haha I’ve never heard that before how funny :-p I’ll have ot Google it too. Thanks Kevin! In East London the gherkins in fish & chip shops have always been called whallies, not sure why. I’ve never considered making my own gherkins before! I know hubby would be so happy if I made these for him 😀 Need to give it a go! Emma! I simply adore pickles! I prefer the “half sour” kind which are still bright green yet the cucumber is slightly pickled…These would make great holiday gifts in a food basket…I like the name gherkin…I think in the US, that’s the name for the tiny cucumber ones? I’m not sure 🙂 But with any name, I love anything pickled! Pretty photo too of the pickles in the Bell jar! Sorry to hear you found them too salty Sarah – I guess its a preference thing. I much prefer salty pickles to sweet ones!